The crisis-hit nation has now received half of the package it was pencilled to get from the ESM. A family reflected from the main class door of an empty closed shop as they walk at Ledra pedestrian street in central Nicosia, Cyprus, this month. THE EUROPEAN UNION’s financial emergency fund released an aid tranche of €1.5 billion to Cyprus today, part of a controversial bailout agreed earlier this year. The release from the European Stability Mechanism (ESM) was agreed by the 17 finance ministers of the Eurogroup earlier this month after Cyprus had enacted stringent measures in return for the loans. The tranche is part of a combined €10 billion financing package made with the International Monetary Fund (IMF). To get the loan package, the government had to take over major banks and agree to large spending cuts and tax hikes as well as the sale of some state-owned assets. 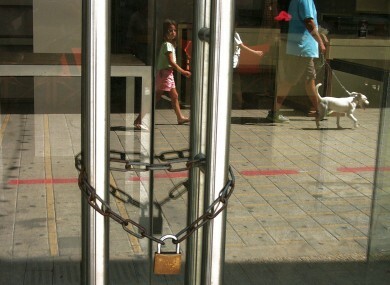 The country plunged into crisis in 2012 as Greece’s meltdown spread, leaving a number of Cyprus’s top banks insolvent. Big depositors finally were forced to accept reductions in the value of their bank accounts. Cyprus has now received €4.5 billion of the €9 billion expected from the ESM. It has also received about €170 million of €1 billion expected from the IMF. On July 31 the IMF, European Central Bank and European Commission said in a review that Cyprus’s restructuring programme was on track. However, the so-called troika of creditors warned that the short-term economic outlook was poor, with output projected to contract 13 per cent in 2013-2014. Email “Cyprus gets €1.5bn from EU's emergency fund”. Feedback on “Cyprus gets €1.5bn from EU's emergency fund”.